Radishes love the cool temperatures of early spring and many varieties are ready to harvest within a month of planting. 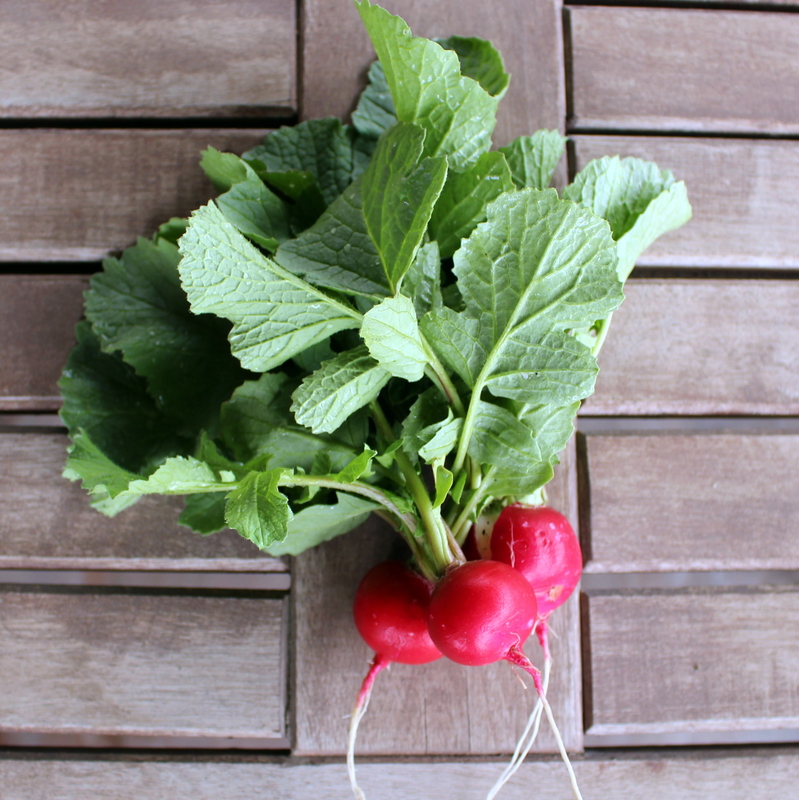 In my Zone 5 garden, we usually plant radishes as soon as the soil can be worked in March and enjoy them by mid-April. One of spring’s many little joys is that first bite of radish from the garden. I will admit that sometimes the first radish doesn’t even make it into the house. I’ll just brush off the dirt and bite into the red skin and crisp white flesh right there among the beds of spinach and baby greens. In the kitchen, radishes are a crunchy, peppery accompaniment to a salad or a great little nosh on their own with just a sprinkle of sea salt. But quite possibly the best way to eat radishes is in a creamy butter spread served on warm, crusty baguette slices. Radish butter is a riff on the classic French way of eating radishes that have been spread with butter and sprinkled with seasoned salt. My version was inspired by a recipe found in one of my favorite farm to table cookbooks, Deborah Madison’s Local Flavors: Cooking and Eating from America’s Farmers’ Markets (Amazon affiliate link below). 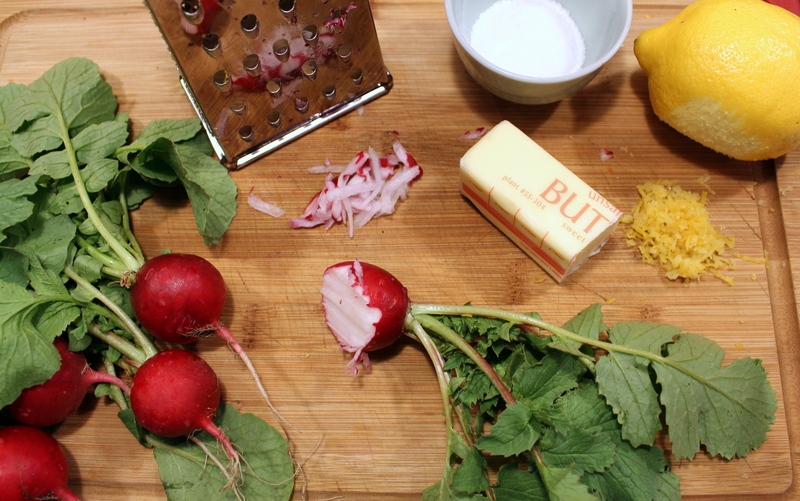 This spring, when you come across fresh local radishes at the market or – better yet – in your own backyard garden, give radish butter a try. I promise you will never look at a radish the same way again. 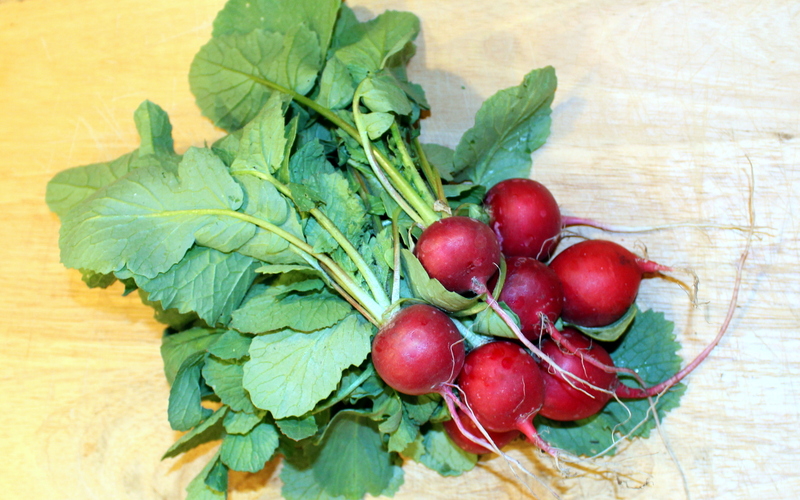 Select fresh radishes with small, firm bulbs and intact greens. I use a scarlet globe variety for this recipe because I like the contrast of the bright red skin against the butter, but you can use any variety that has a little spice to complement the butter’s creaminess. The other ingredients to this amazingly simple recipe are pantry and refrigerator staples: unsalted butter, lemon zest, and sea salt. Whip it up in just minutes and serve with a warm baguette or other loaf of crusty bread. Wash the radishes and trim the root end. Leaving the greens in place to use as a handle and using the coarse grating surface of a box grater, grate the radish bulbs. Squeeze grated radishes to remove excess moisture. Set aside. Select 10-12 of the most tender radish leaves and remove any coarse stems. Finely chop the leaves. Set aside. 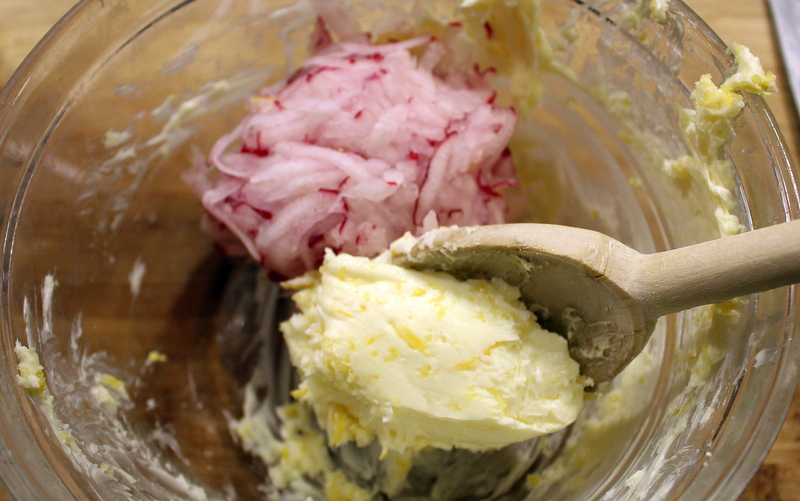 Combine the butter and lemon zest, then stir in the grated radishes, chopped leaves, and sea salt. Spread on slices of warm, crusty bread and serve. This entry was posted in Cooking with Garden Produce and tagged home cooking, radish butter, radishes, recipe by Deborah Neyens. Bookmark the permalink.